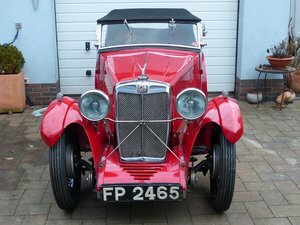 THE F-TYPE MAGNA RANGE WAS ONLY PRODUCED BETWEEN 1931 AND 1932 AND WAS CREATED TO FILL THE EVIDENT GAP THAT EXISTED BETWEEN THE VERY AFFORDABLE M-TYPE MIDGET AND THE FAR DEARER 18/80 RANGE OF CARS. IT WAS EFFECTIVELY A SIX-CYLINDER, LONGER WHEELBASE VERSION OF THE FOUR-CYLINDER D-TYPE LAUNCHED AT THE SAME TIME, AND THEREFORE FEATURED A NEWLY DESIGNED, RIVETED STEEL CHASSIS WITH SLIDING TRUNNION SUSPENSION, UNDERSLUNG REAR AXLE AND CENTRE-LOCK WIRE WHEELS. THOUGH SUPPOSEDLY NEW, THE 1271CC ENGINE WAS IN FACT AN EXTENDED VERSION OF THE WOLSELEY HORNET UNIT, BUT EQUIPPED WITH DUMMY SIDE COVERS IN ORDER TO APPEAR TO BE OF FRESH DESIGN. ITS POWER OUTPUT WAS 37.2BHP AND IT DROVE TO THE REAR WHEELS VIA A STRAIGHT-CUT ENV GEARBOX. IN HOOD-DOWN GUISE, THE MAGNA WAS CAPABLE OF 72MPH-PLUS FLAT OUT.